Docker is a tool used to create and run containers, self-sufficient units that can have their own operating system, tools, and libraries, and run your code in an isolated environment. That means you don't have to worry about the libraries and the operating system architecture which can be different than your own development environment. 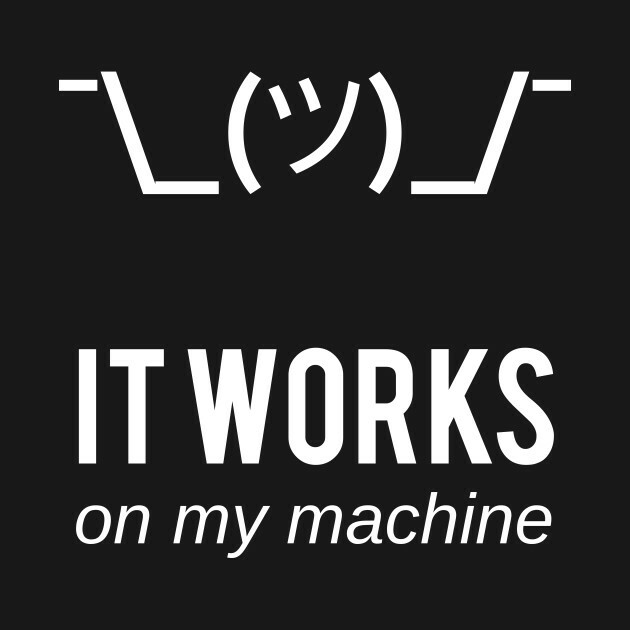 Docker solves one of the most common excuses developers use when the production code fails: "But, it works on my machine". Docker is an engine for creating containers. You can think of it as an operating system that can be mounted inside another operating system, and managed by the Docker engine. Container - A standardized unit of software, a container will typically run an operating system, any libraries that we may need, and our application. Image - An image holds the layers that when mounted on the Docker engine, can operate as a container. Dockerfile - A Dockerfile is a blueprint for creating a Docker image, it can inherit from another container, define what software to install, what files to transfer from our computer to the image, and what commands to run. OSX and Windows Pro users: The easiest way is to use Docker desktop which you can download here. All you need to do is download the version for your operating system and follow the installer instructions. For any other operating system: Please follow the official installation guide. We will cover publishing containers to Docker Hub, and for that we will have to register as a user here. Once registered, we need to set the credentials in our local Docker, and here are three different ways to do so. Once installed, you should have the docker command available. Open your terminal/cmd and write the following command to check if Docker is installed: docker -v, and the output should look like this: Docker version 18.09.1, build 4c52b90. We called docker run <image-id> to tell docker what image to run. We saw a message telling us Unable to find image 'hello-world:latest' locally. This is because we run it for the first time. The ":latest" part here is the image tag. We can tag an image with whatever we want (dev, v0.1.1, my-tag, etc...), but the default tag is latest. Since the image was not found locally, docker had to get it from somewhere, and we got it from Docker Hub. 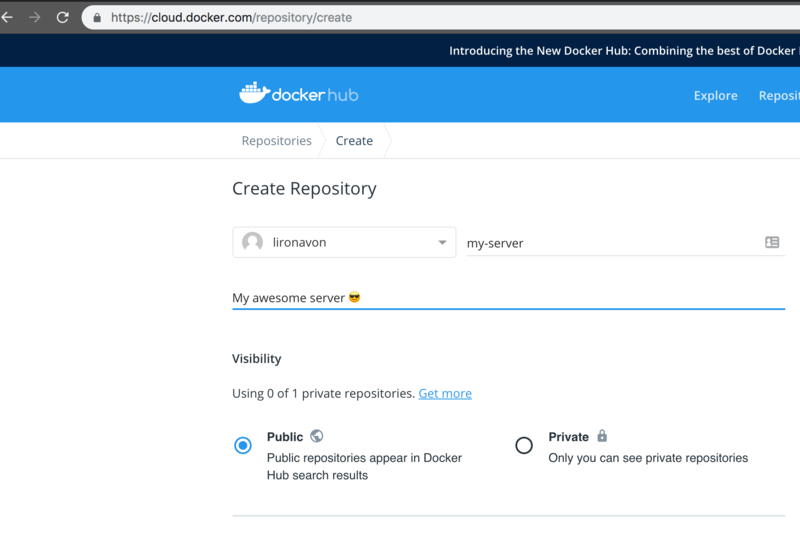 Docker Hub in concept is similar to GitHub, but instead of hosting repositories, it hosts images, and often those images are open sourced. But there are also private images. The -it flag tells Docker to attach the container to the terminal, so CTRL+C should kill the container. If you want the container to keep running, drop this flag. Let's build our own container! For this Docker tutorial, we can choose between using Node.js or Go (just pick one). In reality you should be able to use pretty much any server technology you want (.net, Python, PHP, etc...). You don't even need to install Go or Node.js to run the examples, since Docker will handle the dependencies for us. First, let's create a directory for our little project and call it docker-example. When running any of these applications (node server.js, or go run server) you should be able to go to http://localhost:8000/ in the browser and see our message. You should also see a message in the terminal. The next step in this Docker tutorial is to write our first Dockerfile. The file name should be Dockerfile, with no extensions. FROM: Start from a base image. This could be an os like Alpine or Ubuntu, or a known image that contains dependencies for us like databases, or language tools. WORKDIR: set a working directory inside the container. COPY: copy the files you need. For simplicity, I copy it all and build inside the container. RUN: you can add multiple RUN commands, each of them is a simple command to be executed in the terminal, those will run when building the image. EXPOSE: you can set ports to expose. I chose 8000 since I also use that port in the servers. CMD: a command to run when starting the container. Sometimes you would see it as an array CMD ['npm', 'start'], and sometimes as a command CMD npm start - both are accepted. There are a few more commands for Dockerfiles, but these are the most used ones. Here are examples for a Dockerfile for Go and Node.js, pick the one you built the server with. npm install is commented out, since we don't use any npm packages, but this is where you would call it. Let's build an image and run our container! To build the image you simply need to go into the directory with the Dockerfile and run docker build .. You can replace the . with the path to the directory. Step 3/6 : COPY . .
As you can see, Docker will specify the commands that it's running and ends up giving us an image id on the last line: 8675fc90ccdd. Just note it down somewhere since we will use it later. The -p 8000:8000 part of the commands tells docker to redirect from localhost:8000 to the container-ip:8000. Now you should be able to check out the browser and see the message from our server. After you name the image, scroll down and click create. Now we can push it to Docker Hub. # see more information about a container, you can use its ID or its name. One of the hardest things for me when I started to work with containers, was debugging, but after a while, I learned you could actually debug applications inside the container! It might take a while for the initial setup, but it's worth it. I will show how to do it in Node.js since it's the most straight forward, but I will link to a few other tutorials, and you should find one for your language of choice easily. The --inspect-brk=0.0.0.0 flag tells node to run in debug mode, and the -brk part tells it to stop at the first line, the 0.0.0.0 part tells it to accept connections from any IP, since we are going to access it from the host IP and not from the container localhost. docker build -f debug.Dockerfile . # make sure to use the image id we just built instead of "7b4bec4dc9b4"
Now you can open chrome, go to chrome://inspect and you should see a remote target named server.js. Clicking it will open a chrome debugger for us. Most debuggers are capable of exposing a web API for debugging. Here is a list of some of the languages and how to debug them. You should be able to find documentation for other languages easily. Docker is a great tool, and it is massive. You should also take a look at other tools like Docker Swarm, Docker Compose or Kubernetes that increase the productivity and the ease of deployment of containers. In this Docker tutorial for beginners, we went through the process of installing Docker, running our first container and dockerizing our first application. We've also demonstrated how to push your Docker images to Docker Hub. Let me know in the comments below how you liked this tutorial and please share it with whoever might find it useful.